Mimi keeping a safe distance. I unintentionally watered Mimi with the hose earlier so she is keeping her distance for now. If you look closely she is talking. We had a great time out in the yard on Sunday morning. There had been little to no rain all week and my fledgling garden needed to be watered. 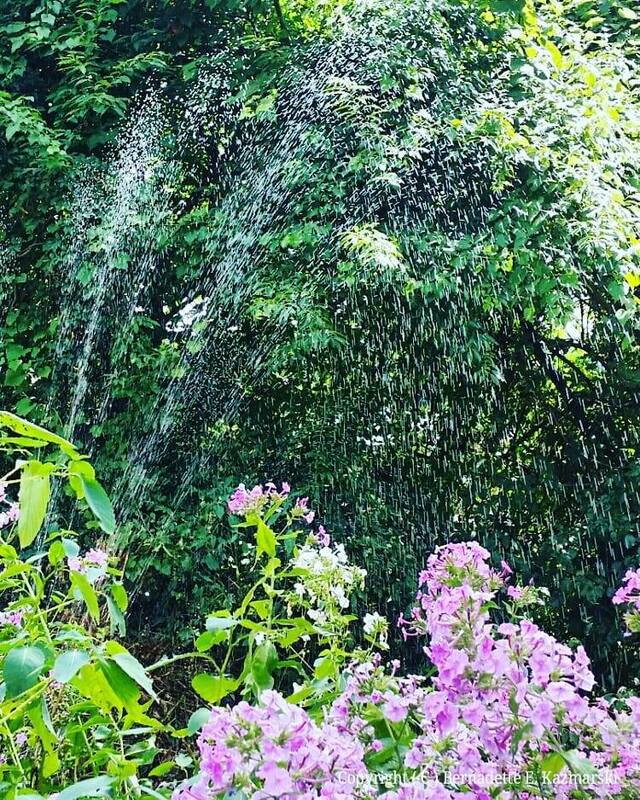 Normally I find the old oscillating sprinkler to be wasteful and I’ll carry watering cans or water each plant by hand, but there’s just something about watching that sprinkler swinging slowly back and forth and spattering the entire garden. Watering like that is actually good for the birds and the bees too. I keep bird baths around which bees and butterflies use as well, but getting some humidity in the air and droplets on the leaves is good for them all, and I’ll often see both birds and bees fly in the water spray. Plus, it’s cool for photos. It isn’t summer until I bring out the heirloom oscillating sprinkler just once. My mother bought it some time in the 1950s. Up on the Container, It’s a Spider, It’s a Drone, It’s Two Synchronized Napping Cats in Formation! We don’t call ourselves “The Creative Cat” for nothing—look, two of my creative cats have made a sculpture of themselves sleeping in formation. But when I first turned around and saw this…whatever, I just wasn’t sure what to think! But I knew I had to take a photo of it, whatever it was. It turned out to be Giuseppe and Mr. Sunshine sleeping in mirrored positions. How likely is that to ever happen? I’m glad we nearly broke the internets with it. And below, two different brothers, but still synchronized. Head tilt, ears, eyes, paws, all pretty much the same. Last Friday I complained the boys were killing me with cuteness and I took way too many photos of them. When I finally had the chance to look through them all I saw some interesting patterns in their positions—heads at the same angle, ears at the same attentiveness, even the same ear turned sideways at just the same little swivel, whiskers fanned in the same way. Giuseppe and Bean have always been the closest buddies out of the four and I have many photo sessions of them being spectacularly cute when they are totally relaxed with each other, but I’ve never had the chance to catch it quite like it was in these photos. Below is a view of the two at a with their heads up and both looking quite the same as they study something, then after that photo are several of them napping, watch the eyes and ears, how they move together. The one difference is that if Jelly Bean was one of the dwarfs he’d be Sleepy for sure, he takes his naps seriously and doesn’t open his eyes. Giuseppe is too curious about what I’m doing and can’t keep his eyes closed. Hamlet is today’s office cat. Look at his relaxed expression. He has come so far from the frightened angry housepanther we couldn’t get near enough to touch. One of her favorite places. Watching the world go by. What other photos have I posted on or around this date? Michelle greets some of her biggest fans. Friday was such a busy day and it was all about cats! Well not really, but all the visitors were, and I shared them all on Facebook and Instagram. Above, Dr. Michelle stopped by for a round of flea treatments and claw trimmings for regulars and fosters, 11 cats in all! And for stopping by each week to help me care for and socialize my foster kittens. 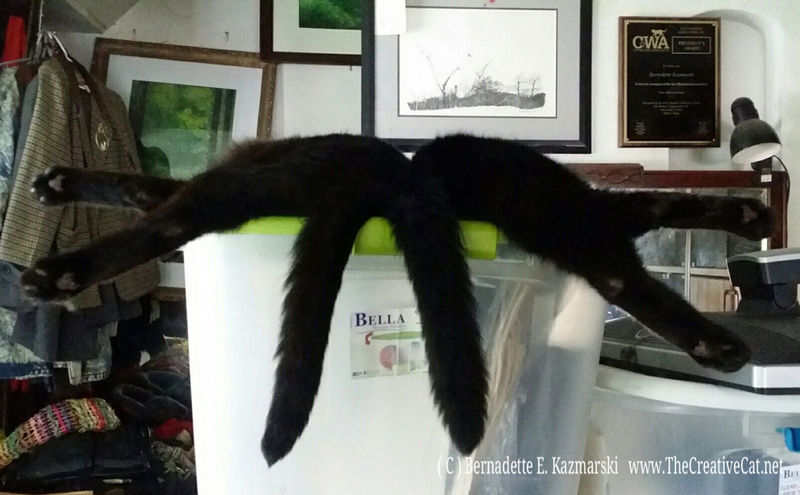 And for petting my poor neglected house panthers and little Charmee–look at those happy tails below! Look at those happy tails! And them Margo stopped by to pick up the traps Michelle had also dropped off for Margo to trap a colony of 20 cats this weekend for the clinic on Sunday. She was greeted by everyone, and then we went upstairs to see Alvina, Simon and Theodore. Alvina is still a little hesitant, but her brothers are happy to see everyone. Eventually Alvina decided she wasn’t going to let her brothers get all the attention. Margo greets all three kittens. Below is a gallery of images from the rest of their visit. Theodore and Simon get on her lap. Alvina has her pets too. And then the food lady arrived! Thanks Deana Ann Boggs for stopping with food for Alvina, Simon and Theodore! And to whoever donated the food to Pittsburgh CAT. Giuseppe, Charm and Sunshine were happy to meet you! Deanna comes to the door with food for the kids upstairs. Giuseppe, Charm and Mr. Sunshine asked her for the password. She’s greeted by Giuseppe, Charm and Mr. Sunshine. Most exciting of all Mimi and I discovered we have a squatter living under our deck! This year’s groundhog moved in under my deck, excavated a new home, climbed the steps up to the deck and ate my parsley. He has a yard full of species-appropriate food. Mimi wants to eat him. She is always on leash for now and hates it. I’ve had a young one move in each summer for about 10 years–they nest in the neighbors’ abandoned yards across the street, and the young ones go in search of new homes, and this one is definitely juvenile. They excavated along my basement wall where the soil had been hardpacked, and now water comes in, been a problem for a decade. He emerges from under the steps on the side of the deck. I’ve always done the dirty cat litter trick to make them leave. They may look like walking dispose-alls but they are actually very fastidious animals and the idea of dirty litter anywhere near their home is apparently more than they can take. When I moved in they were nesting in my yard, and that’s how I convinced them to leave as I have no shortage of used cat litter. In all my years of trying to decoy them with other foods they would happily eat the decoy and also my vegetables. I won’t tell you what I yell at them about being a gourmet pot roast after having eaten my heritage organic vegetables and herbs. I don’t want Mimi tangling with a groundhog! Mimi wants to eat him. Two cats are happily napping on the bed in the afternoon. Oh, wait! There are three? Where is that third cat? Oh, I see! It’s that lump under the quilt! Giuseppe had to get his under-the-covers nap even though it’s not at all cold, quite pleasant, and not only that but he had to roll back the entire edge of the quilt and mess up the bed covers in the meantime. Mr. Sunshine looks a little perturbed about that. But that’s Giuseppe. Mimi and Mr. Sunshine insisted in lying about all over my desk, so I told them if they weren’t going to move to free up my desk space for what I needed to do then they’d need to some work. Above is “work” for a cat, lying about in the same position as before, but with papers sorted onto them. Well, it worked for me, at least until they moved, and they seemed to enjoy being helpful. Don’t they look as if they are enjoying their work? I wish my camera would make loud painful screeching noises when it set on ISO1600. You’d think it would lighten up the blacks, but this is all the farther I can adjust them. Had it on 1600 unintentionally for most of the day and got some other interesting effects too! Mr. Sunshine drapes himself off the edge, but I see two other ears up there. Chilling together in the tub. The “cool” thing about older cats is they’ve done all this before. It’s been hot, it didn’t go away no matter how much they complained, they found the tub, and that was that. I’m fairly certain these two would have found the tub even if they hadn’t been residing in the bathroom. The tub is now full of cat hair and I’ve had to baking soda-vinegar the drain once already, but if they are happy, I’m happy. I opened the bathroom door so they could wander the upstairs—all three rooms/200 sq. ft. of it—and blocked the stairs with a baby gate. I’ve done this since Monday and so far, so good. Jojo pretty much stays in the bathroom though she enjoyed an evening stretched on the floor in my studio under the ceiling fan until the spectacular explosions of the transformer put out the lights. But Lakota visits all the rooms, napped on the bed, stretches on the studio floor. When they saw each other he and my cats had a hiss fest then gave it up. My cats stay out of the bathroom and hang out in my studio and on the landing on top of things as they always did and he naps on the floor, it seems to work fine. I’m still trying to prohibit direct contact since they haven’t been FIV/FeLV tested, but hissing at each other from several feet away and vertical distances included is fairly safe. Virginia, who really really wanted her photo taken. “I always wanted to be a model,” the slender white cat wearing a gray cloche hat at a jaunty angle said. “Unfortunately, I caught this disease and my career was over. But I’d so like it if you’d take my photo.” Sweet, quiet, dignified, that is Virginia. Virginia is one of the cats who lives at In Care of Cats Sanctuary. I met so many cats that I didn’t get the time to ask each individual story, but I do know that Virginia is so named because she originated in that state. I’d photographed her when I first came in, below, happily sleeping in the sun, and she awoke and looked at me just in time to let the sun shine through her pale coral ears. I turned around and indeed there was Virginia sitting tall and perfectly balanced, paws placed just so, her head at a coy tilt. She blinked once, then continued to look at me. I took several photos, the lighting was a little difficult and I wanted to be certain I caught all the nuances of Virginia. I photographed so many cats that day and so many cats on a regular basis, and surely I do my best to describe them with these images, or to capture an interesting view with all the abilities of myself and my equipment, but a truly beautiful being is beautiful no matter what you do or who takes the photo. Every photo of Virginia was interesting, distinctive and lovely, and that was not my talent but her natural beauty. As I photographed her many impressions wandered through my imagination, a story, a 1920s flapper girl, a 1930s stage actress, young and beautiful, overcoming great odds as a woman in that day and the challenges of those days with a promising career, but some illness, in those days deadly, today curable, put a stop to that, but she never lost her dignity. I can’t save her, no one can; her disease, feline leukemia virus, will soon take her life, but she will be remembered here for her natural beauty, grace and dignity. Virginia, when I first entered the sanctuary. Feline Photos from Portraits of Animals! For several years before moving in with me, Mimi “belonged” to a neighbor who would not spay her and she had six litters of kittens*. 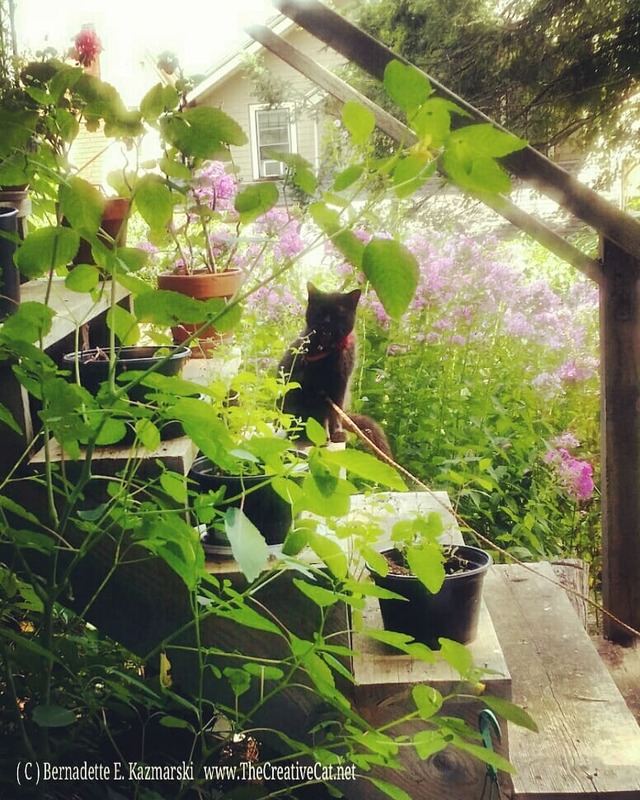 She hunted for food for her kittens, and my yard was her territory. Now that she’s a pampered princess she still likes to indulge now and then, just to keep in shape, though she is on a leash when she is outdoors with me. Read more, and purchase.